Saddle up for Black Beauty as you’ve never seen it before; the McCuddy brothers are guaranteed to whinny you over. These so-called Equestrian Illusionists (or Andy and Andy) are two halves of an unemployed pantomime horse, waiting for their big break. What better (or more apt) way to pass the time than to relive the tale of Black Beauty in the most imaginative and spectacular way possible? So begins this unusual retelling of Anna Sewell’s classic children’s novel. Andy and Andy do warm-up exercises to a panto horse workout tape. Each seemingly random prop is repurposed, often in multiple ways. Black Beauty, Merrylegs and Ginger are represented using shoes, books, handbags, and pretty much anything else available. A pair of pink rubber gloves are used for washing up, to deliver a baby and as udders (the panto horse is in competition with Daisy the cow). Part of the charm of the production is the way the characters fill everyday objects with theatrical magic. The cast of this two-man show pulls off a huge range of characters in a short space of time. The sketches are short, punchy, and dynamic. The children in the audience get to participate and are horse (ahem) with laughter. It’s panto-tastic, and deals with the serious issues from the book (such as breaking in horses violently or overworking them) with a light touch. 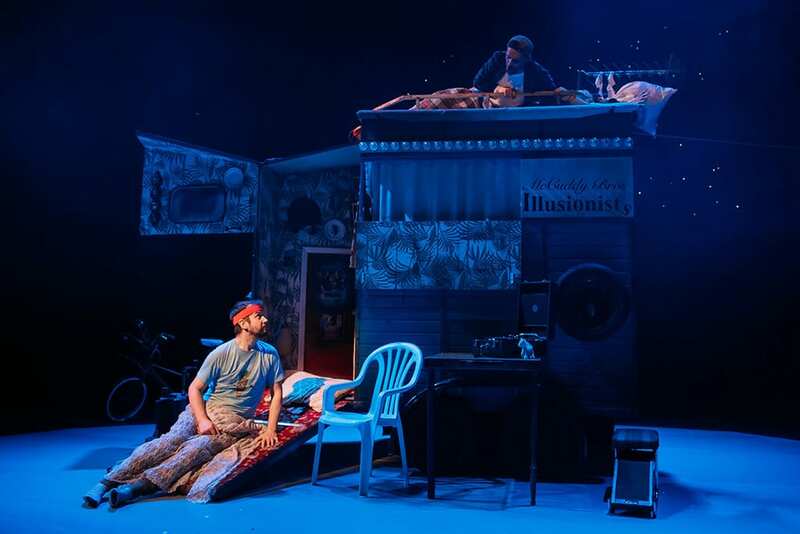 The brothers’ bickering but affectionate relationship is playful and heart-warming, their arguments resolved through storytelling. The soundtrack and brilliantly timed sound effects aren’t just fun – they are the result of a production that has been tightly choreographed so that every moment is accounted for and entertaining. The dance of the panto horse is spot on, and comic timing is perfect throughout. 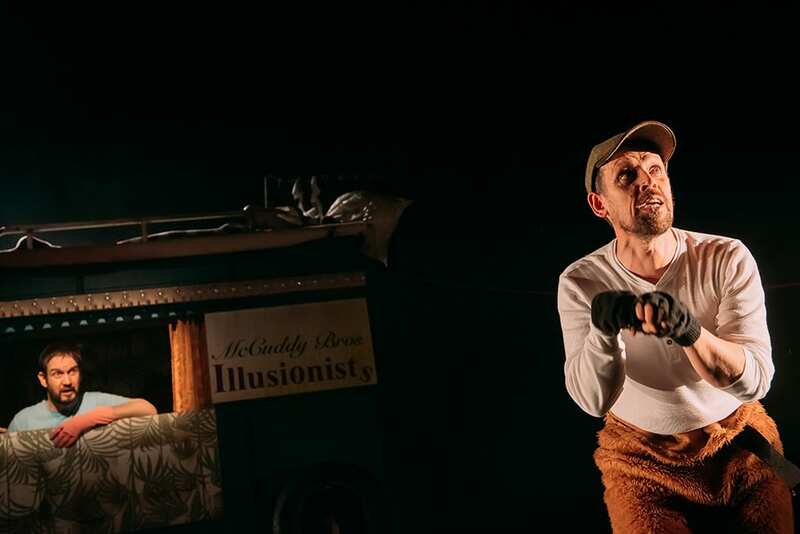 It’s hard to balance the kind of slapstick that appeals to children with the witticisms and creative use of props that keeps adults entertained too, but the Equestrian Illusionists certainly succeed in pleasing both. As the Guardian puts it, this is a ‘galloping triumph’. 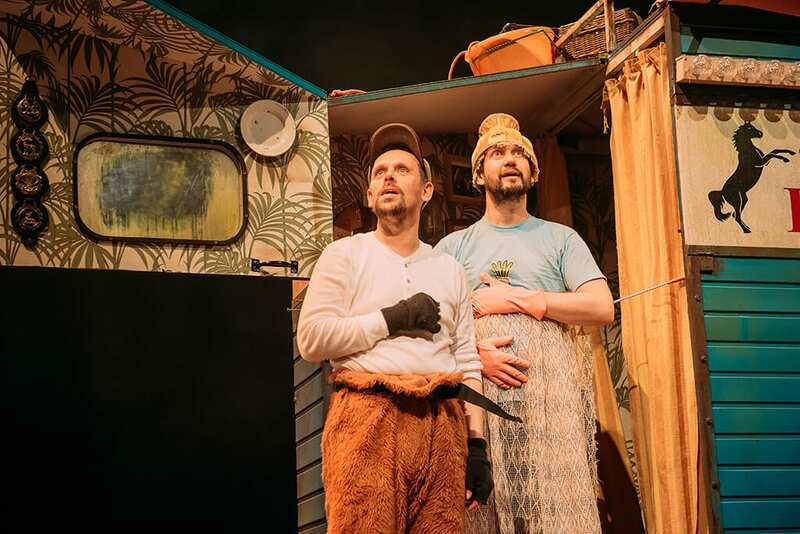 Nothing quite beats the absurd ending of the play – a trailer of the brothers’ forthcoming film, which is all dramatic music and long shots of the Andy and Andy as the panto horse, galloping through fields of corn. 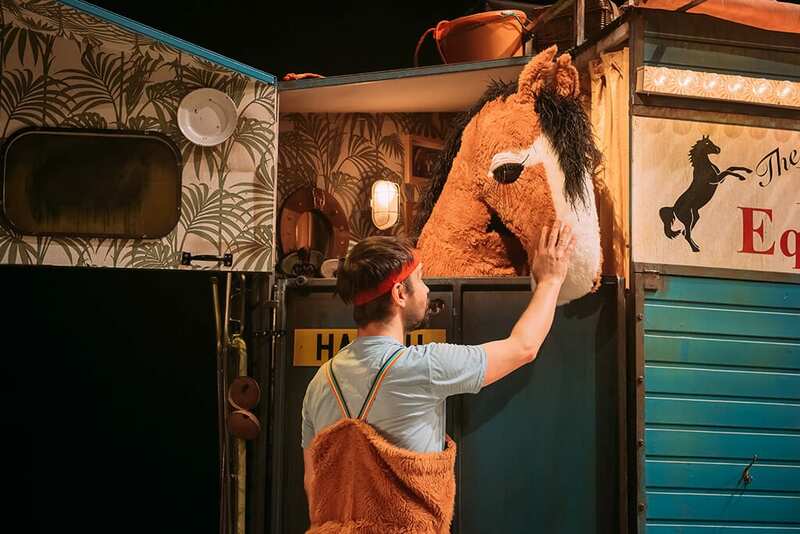 If the tour of this production trots into your neigh-bourhood (see what I did there? Couldn’t resist), make sure you bring your foals along for a night of equestrian delights.